I’ve joined Peter M. Ball’s Sunday Circle to help keep on task with of my writing. Follow along here or join in the fun over at Peter’s blog, Man Versus Bear. 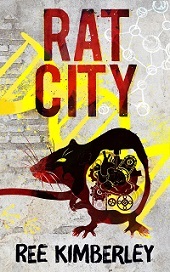 I’m continuing work on the first draft of Rise of the Rat Generation, the sequel to my YA speculative fiction novel, Rat City. This week the words having been flowing more easily, maybe because I remembered to “invite in the geniuses” before I started writing. This is an Elizabeth Gilbert technique, which sounds kind of crazy but it works for me every time. The story started going in a different direction from what I was expecting, but I’m liking it so far. The geniuses know best! For the second week in a row I summoned up the courage to go to a local French language meet-up. I’ve been learning French since 2014 and although I read reasonably well, I struggle with listening and speaking skills, so the practice at the meet-up is invaluable. Like most writers, my natural tendency is to be introverted, so attending a meet-up is daunting at first. But I’m getting so much from it I’m determined to go regularly. Facing my fears is a good thing. I had intended to start work on a couple of fellowship applications this week but time got away from me. I’m not avoiding it so much as having trouble fitting everything in. I got a bit behind schedule last week because I helped my son move house but I’ve almost caught up on everything now. So the fellowship applications are top of the agenda for the coming week.